Extraordinary recognized achievements in the motion picture and television fields, demonstrated by sustained national or international acclaim, to work in their field of expertise. What are the different types of 'O' Non-immigrant classifications? O-1A - Extraordinary ability in the sciences, education, business, or athletics (not including the arts, motion pictures or television industry). O-1B - Extraordinary ability in the arts or extraordinary achievement in motion picture or television industry. O-2 - Individuals who will accompany an O-1, artist or athlete, to assist in a specific event or performance. For an O-1A, the O-2â€™s assistance must be an â€œintegral partâ€� of the O-1Aâ€™s activity. For an O-1B, the O-2â€™s assistance must be â€œessentialâ€� to the completion of the O-1Bâ€™s production. The O-2 worker has critical skills and experience with the O-1 that cannot be easily performed by a U.S. worker and which are essential to the successful performance of the O-1. O-3 - Spouse or children of O-1â€™s and O-2â€™s. To qualify for an O-1 visa, the visa applicant must demonstrate 'extraordinary ability' by sustained national or international acclaim. The beneficiary must be coming temporarily to the United States to continue work in the area of extraordinary ability. Extraordinary ability in the fields of science, education, business or athletics - this is defined as a level of expertise indicating that the person is one of the small percentage who has risen to the very top of the field of endeavor. Extraordinary ability in the field of arts - this is defined as 'distinction'. Distinction means a high level of achievement in the field of the arts evidenced by a degree of skill and recognition substantially above that ordinarily encountered to the extent that a person described as prominent is renowned, leading, or well-known in the field of arts. 1. Basis of Expertise - Outline the expertise or authority of the person writing the letter of recommendation. 2. Relationship - The writer of the letter should state how they have known the O-1 applicant, and how they became familiar with their work. 3. Talent and Ability - The writer should focus on describing the visa applicant's 'talent', 'skill' and 'extraordinary ability', and give reasons why they have talent or ability. 4. Recognition and Accomplishments - Demonstrate how the applicant's career is different and unique from others in their field, and what sets them apart from others in the industry. The writer should specify any outstanding accomplishments or recognition in their field. 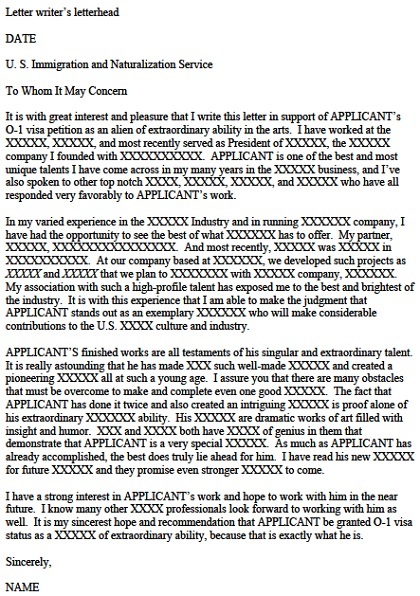 For example, the applicant had a lead role in a very successful production. 5. Miscellaneous - Provide any other supplementary information that enhances credibility to the application, such as awards won or collaboration with famous artists. 6. Conclusion - Closing paragraph that provides reinforcement of the applicant's extraordinary value for the American cultural scene.